Coconut oil is a nutrient rich fat that is extracted from the kernel or 'meat' of the coconut. Due to the saturated nature of this unique fat, oxidization occurs slowly over long periods of time making it possible to store away for years without spoiling. Aside from its many uses in the kitchen, the last few years have seen a huge amount of interest in the medicinal properties coconut oil can offer. Saturated fatty acids - Coconut oil is packed full of medium chain triglycerides, which help our bodies to assimilate nutrients. The most well known of these is Lauric acid, which is thought to help fight viruses and bacteria that cause diseases such as herpes, influenza, cytomegalovirus, and even HIV. Polyunsaturated fatty acids - Linoleic acid is a polyunsaturated fat normally associated with grass fed beef products that has been linked to long-term weight management and optimal health. Monounsaturated fatty acids - Oleic acid can be found naturally occurring in many foods, including milk and coconut oil. It is known to help reduce blood pressure as well as protect cells from free radical damage. Polyphenols - Coconut contains a number of polyphenol micronutrients including Gallic acid that has shown benefits in the prevention of degenerative diseases such as cancer and cardiovascular disease. Coconut oil also contains a number of derivatives of fatty acids including; fatty polysorbates, betaines, ethanolamide, fatty esters, ethoxylates, monoglycerides and polyol esters. Vitamin E, vitamin K and minerals such as iron are also present in high quality coconut oil. After a nasty burn you can expect to be in pain for some time. Once this initial sting subsides you may be fooled into thinking you are over the worst of it, however, burns can become easily infected. In fact, more people die each year as a result of secondary infections than burns themselves making good aftercare essential. 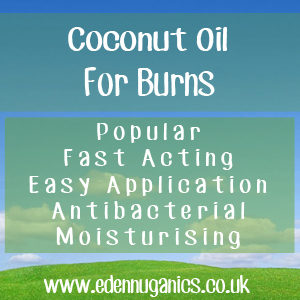 Coconut oil possesses a plethora of antimicrobial properties that can help to keep at bay any bacterial or viral invaders while also moisturising the area and promoting the healing of skin. How to Apply to Burns? At room temperature coconut oil forms a solid white wax like consistency. However, once in contact with body heat it will become liquid in a matter of seconds. This makes it much easier than applying creams over burnt patches of skin. Simply warm a grape size amount between the palms of your clean hands and gently cover the affected area. This can be repeated up to eight times a day until it heals. Can Coconut Oil Be Used as a Sun Cream? Even though coconut oil will work as a great after sun treatment, it will not block the sun's harmful UV rays. If you intend on being in the sun for long periods of time make sure you buy a sun cream with up-to-date SPFs and UVA ratings. H2O2 - Hydrogen Peroxide is one of the most popular natural antiseptic formulas used in the treatment of minor burns. It is a simple solution consisting of two hydrogen and two oxygen atoms. The oxidative nature makes it highly reactive and offers the liquid its range of antibacterial, antiviral and antifungal properties. Colloidal Silver - Like H2O2 Colloidal silver is a powerful antimicrobial liquid that can be used in the treatment of burns. Simply pour a small amount over the affected area 3 - 4 times daily until healed to prevent infection.